Once again, it’s been a very long time since my last post. Dreamsofmyfava is languishing. Yet I am thriving. Living. Slowly learning how to be in the world more fully as I am. Which maybe isn’t the same as being the person I wish I was or could be. It’s all very interesting. At least to me. I’ve also been very busy with big projects at work. Indeed, I think maybe all my energy for writing has been directed there. So that I’m now writing this blog post only because on Friday I finally finished the reply brief in a really big case I’ve spent huge amounts of time and energy on in the past year and won’t start work on a new case until Monday. Mental space is crucial. 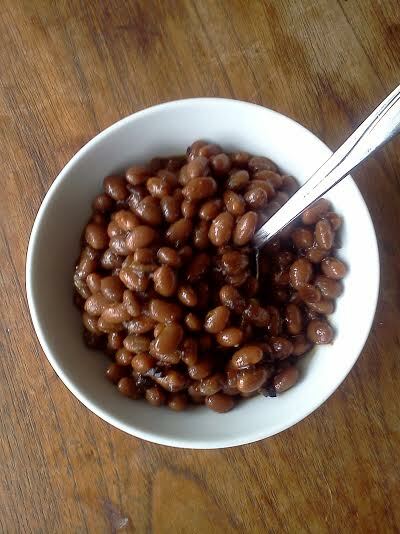 But this post is meant to be about Boston Baked Beans, which I made yesterday. I was inspired by my recent trip to New England. I was there last weekend to visit a dear friend and her husband, who live in Cambridge, Massachusetts. 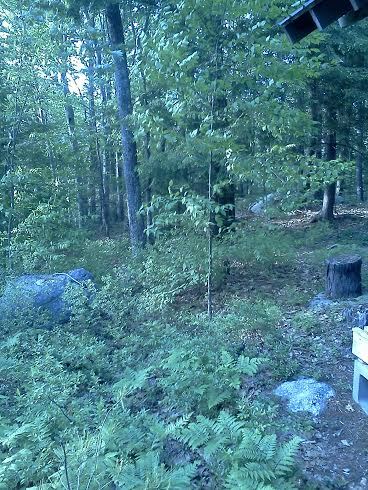 We spent a little time in Cambridge, but mostly we were in their family’s cabin in New Hampshire. The cabin has no electricity or running water. Which maybe sounds terrible. But instead it was lovely. I’d been there once before, for their wedding several years ago. This time was different, though, because it was just the three of us and their dog, surrounded by and immersed in nature. And probably because I am so different now from how I was then. My friend’s parents built the cabin thirty years ago, and have gradually added a million thoughtful details. 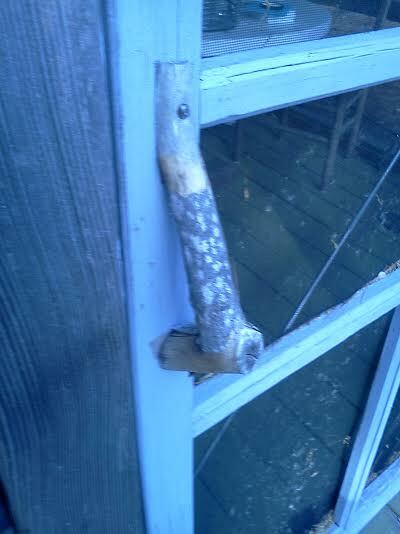 Like this handle on the screen door to the gazebo. Or the handwashing station next to the outhouse, which I didn’t photograph. So you’ll have to trust my words to convince you that it somehow managed to be more luxurious than any bathroom I’ve ever visited. An outhouse that smelled of wood and air. I guess it smells of wood and air because there are trees everywhere and not much else. Except a few large stones, because the area was formed by glaciers. As for the man-made aspects, another standout, which I again failed to document, was the garden, where one could easily get lost in meditation while ostensibly choosing and picking herbs and leaves for sandwiches, salads, eggs. The cabin itself seems to have arisen organically, as if it was grown rather than built. Because there are so many considerate touches. Like the candleholders that are placed here and there and everywhere, so that they’re just where you want them, including one with a handle, and others that have been mounted to the wall in the back bedroom where I slept. That bedroom also held a basin so I was able to wash up a little inside just before bed and in the morning. 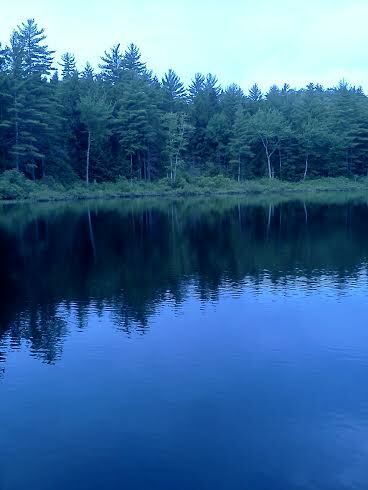 More extensive wash ups come with swimming outside in “The Pond,” which is apparently the New England word for “lake.” Whatever you called it, this pure body of water is deep and cold and still. Diving in you feel completely alive. And somehow extra clean. I think it was the lack of electricity that rendered the world of the cabin so special, so healing. My breath was deeper, like the way it is after yoga before I emerge into the clamor of city during days here in my normal life. Such a contrast from the cabin, where I felt like I could hear everything inside and out, uninterrupted by the noise I’ve become so accustomed to in Chicago. It was amazing. At one point, I even imagined I heard the trees speaking, not in words but with unmistakable meaning. Clear, direct communication. During this moment when I believed I heard the trees speaking to me, my friend and I were in the gazebo. It had just rained, was raining, with alternating bouts of gusty wind and soft, barely audible patters. I was attuning her to Reiki, level one. (Because I’m a Reiki master now. Which is pretty cool.) 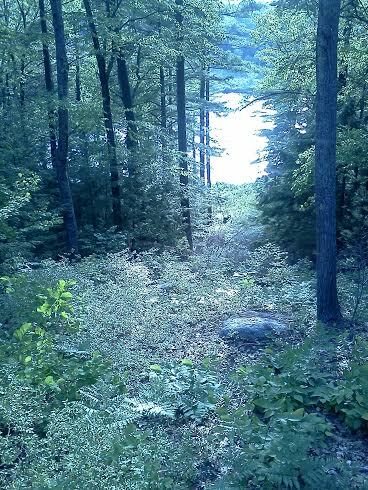 I felt a deep sense of connectedness, with the trees and the stones and the rain and the gazebo and also with my friend, her husband, their dog, everything as one. And suddenly the trees were sending this message about how much they cared about my friend’s well being, recognizing her goodness, her beauty, the feeling they had of her belonging there, with the family, in that place. The trees were expressing their support for what we were doing. Which is cool. Because the trees are such a big part of everything there. It felt good to know or at least believe that we had their support and what felt like their love. Now, writing this, I fear that maybe I sound a little crazy. Or, at best, eccentric. Whimsical. Like my imagination has gone overboard. Which very well may be true. But what I realize now too is that it doesn’t matter. What matters is that feeling. Because the feeling, whether objectively true or not, creates an opening. And with that open heart I allow the world to come in. Then, in that opening, I’m able to come out of myself with a deep faith that things are ultimately good. Which brings me to the recipe. Finally. For a long time baked beans were the only kind of beans that I liked, especially the kind that came in a can with heavy, syrupy sweet good sauce and awful chunks of fatty salt pork that I would fish out and cast to the side. As a kid growing up in the South I would doctor cans of Campbells beans by adding dijon mustard, brown sugar, and a little ketchup, then I’d bake them until the sauce was thick and bubbling. I liked to scoop them up with potato chips as a side for burgers. Nowadays, when I’m trying to avoid anything with refined sugar, I eat almost no processed food. (Except chips. Damn chips.) This means I no longer buy any kind of canned baked beans. But I still love them. 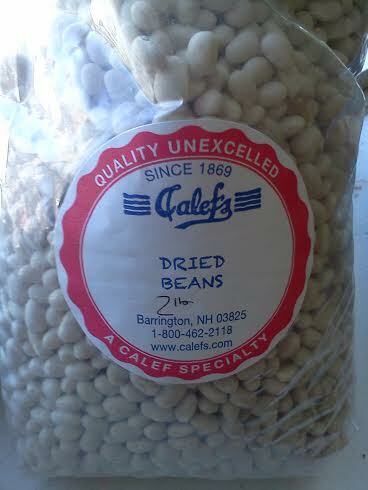 So, when we stopped at Calef’s County Store on the way home from the cabin, I was super excited to see these beans. Then, last Sunday, lying in the guest bed in quiet, quiet Cambridge, I searched my friend’s extensive cookbook collection for baked bean recipes. And I decided on this one, an adaption from Slow Cooker Revolution. It took a really long time and wound up having to finish in the oven. But the flavor is perfect. I recommend. If using the oven, preheat to 350. Drain and rinse the beans. Transfer them to the slow cooker insert or a dutch oven. Cook the bacon in a skillet over medium heat for 5-7 minutes, until the fat has rendered. Add the onion and cook another five minutes or so, adding the mustard and cloves for the last minute. Add the onion mixture, molasses, maple syrup, and bay leaves to the beans. If using the slow cooker, cook on low for ten hours, or on high for seven hours. If using the oven, cover and cook for a couple of hours. Check occasionally and add water to cover if necessary. When the beans are soft, add a teaspoon or so of coarse sea or kosher salt. Stir and continue cooking until the sauce is thick and bubbling, and the beans are tender but not mushy. I wound up using the oven to finish because the sauce didn’t thicken in the slow cooker. But I will try again. If you try this out, please let me know how it goes. And good luck!